Consistent competition can take a toll on your body. Constant arm extensions push and pull at your muscles as you utilize every part of your arm, forearm, shoulder, and back. Gripping the racket for an extended period of time can also cause for soreness in the hand and may lead to tendinitis. Thankfully, there are relief options in this space. 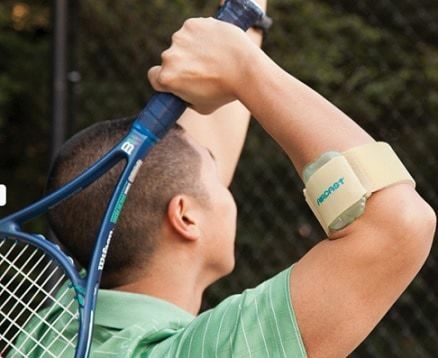 The elbow brace plays a leading prevention role to some of the most common ailments that trouble tennis players. The type of brace makes a huge difference in the amount of support and relief you receive, calling for an in-depth discussion of types, pressure levels, and support locations. Below we will take a thorough look at the different type of braces existing on the market, introduce and describe the common condition known as tennis elbow, and provide additional answers to existing questions that may extend from this informational stream. How do I wash a tennis elbow brace? Will the brace fit my tennis elbow size? When should I wear the elbow brace? 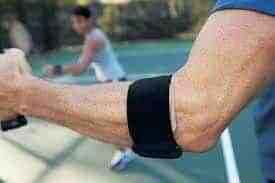 Can I sleep with a tennis elbow brace? Why do tennis elbow braces work? How tight should I make my brace? Before diving into product reviews and informing users of a buying guide, there is an underlying issue that has been plaguing the tennis industry since it's inception: tennis elbow. This common ailment is a staple of the game. If you have played tennis in the past, you have likely experienced this burning sensation. Below we'll detail everything you need to know about this ailment and introduce prevention measures, terming treatments, and detailing other aspects of support. 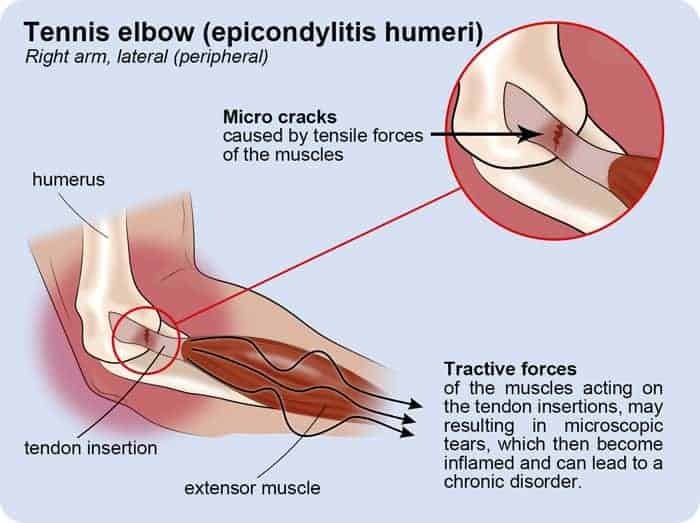 Tennis elbow is inflammation that occurs in the muscles. With tennis, most of the commonly used muscles extend from the forearm area. Since the forearm has direct links to the elbow, inflammations at the forearm region can lead to inflammations and soreness at the elbow. 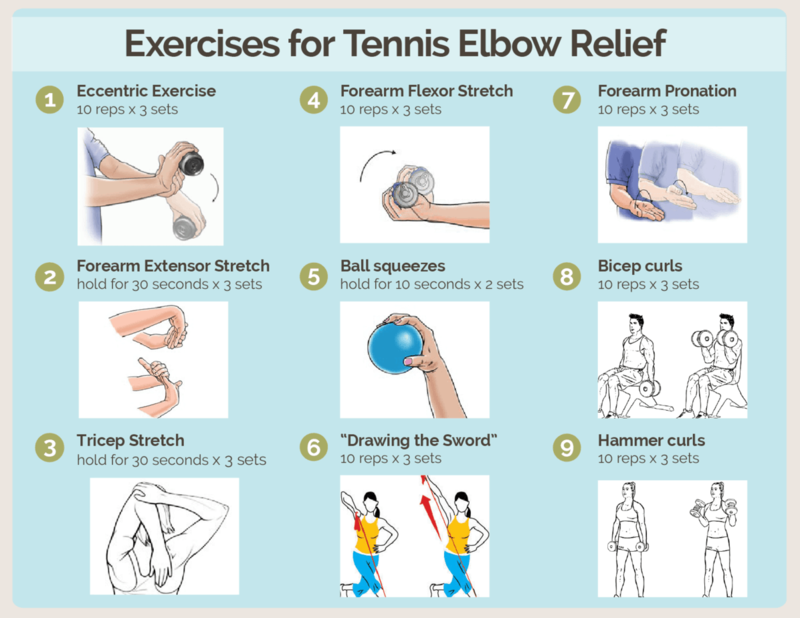 Tennis elbow is a repetitive ailment, meaning it develops from performing an activity often. When you play tennis, the main extremities that you utilize are your arms and legs. The arms trump the legs because you are constantly gripping a racquet. It Is purely an aggravation injury, housing no real prevention measures besides for caring for the forearm region and wearing protective gear to help tame the inflammation. The injury is most common in users that don't play often and those that play heavy amounts. The novice user is at-risk due to the undeveloped strength in the forearm region and the period of no activity extending into full activity. The active user will also experience this ailment due to pure volume of matches. The active user will also play a full speed game, having little time to recover between serves and returns. This will make their movements somewhat robotic, practiced, and consistent. Their playing formats are the definition of repetition, leaving this group as a leading candidate to develop tennis elbow. The injury can also develop from favoring one side of the body. During the learning stages, the user will often favor their best side based on their dominant hand. This will cause little switchover to the weaker side, calling for their dominant side to become overworked. Fewer racquet changes lead to greater symptoms of this ailment. Users who stay consistently grounded also experience this ailment at a higher rate. Footwork and shifty movement is a common staple of the desired tennis skill set. If you have flat feet on the court, you are consistently calling on your upper body to carry you to returns, serving, and other such swinging motions. The user who does not develop fully body movements will experience this common ailment at a higher rate. Switching from periods of inactivity to full-on match play will also heighten your risks. The user must ease themselves back into the pace of play if they are coming off an injury or an off-season. Working and strengthening the upper body is good practice when not on the court. Heightening your repetitions during a workout with help you build a consistent stream of stamina needed to outlast the development of tennis elbow. It is important to locate the warning signs to prevent from leading to life-long cases of tendinitis. One symptom of the ailment is a burning sensation at the elbow. To better understand this sensation, compare it to that of a bad sun burn. When you move your arm around, you will feel an uncomfortable sensation in that region. If you are still able to get a full range of movement from your arm in all directions, you still haven't experienced the worst of it and you can extend your research to the treatment options provided shortly. A second form of this ailment will be a sharp pain. This pain often starts in with aches and develops into a sharp pressure. If you are experiencing aching in the elbow region or within the forearm, refer to the treatment options. Once the pain intensifies to a sharp pain when you move your arm, you are going to want to rest the arm and refrain from match play. Failing to attend to the symptoms can lead to long-term ailments that will plague the elbow and forearm area for the foreseeable future. Thankfully for the tennis player, there are many different treatment options that can help assist with reducing development, treating on-site injury, and preventing from future wear on your arm. The first option is the use of a tennis brace or sleeve. The brace or sleeve mechanism helps provide ample pressure to this region, limiting blood flow. Reducing the flow in this area helps reduce the tendons from flaring up. Since the muscles of the forearm have a direct path to the elbow, cutting off some of the circulation can reduce the tension from reaching the elbow. A complete cutoff of flow is never good, so sizing these items is good practice before purchasing. The elbow guard or brace will also limit overextension in this region. Hyperextending your elbow or forearm at an excessive rate can quickly speed the production of flare ups and pain. Reducing the range of motion in this area will help prevent development and won't negatively affect your game. The second form of treatment is a soothing gel. These flare ups often create a burning sensation, causing your entire arm to heat up. If not treated, this heat can travel throughout the extremities by using tendon connections, which won't create for a positive experience for the user. Soothing gels help to combat this by placing a cool combative to the warm jitters. Heading these two forces against one another will help diminish the burning and replace it with a soothing sensation. Many players will often gel their arms before, during, and after play. Surgery is also an option, but this is for extreme cases only. If the ailment goes untreated, it can zap your tendons into a fury, with the aches and pains extending to periods when your arm is at rest. The tendons can be repaired via surgery but using this option could have a negative impact later in life. People who have a surgically repaired elbow often struggle with tendinitis that can extend to all regions of the arm. Use caution and exhaust your options before heading down the surgery path. Pain relievers also exist for reducing flare ups. These pills are available via over-the-counter and in smaller dose formats. The user has access to pain relievers, but they shouldn't rely on these options as a constant source for reducing flare ups. Over-the-counter medications often contain high doses of unwanted elements. These elements can slow your game in other aspects, calling for smaller doses and limited exposure to medicines. This ailment can also be treated at the professional level by attending physical therapy sessions. There are medical professionals that are well-versed in the arm region, allowing for them to have a greater knowledge base for how it operates. They can prescribe strengthening activities and can give you an avoidance workout that helps reduce the development of tennis elbow by increasing your stamina. Most people will avoid seeking treatment for their ailments, which is not advised, but there are certain things you can work on at home to prevent developments. The first is by reaping the benefits of a proper stretch. Increasing your flexibility is the starting step of reducing hyperextension and limiting tennis elbow. Overhead arm reaches and to touches are a good way to help you gain that extension. By stretching out the muscles before activity, you can better prepare them for adverse movements. A proper stretch can also lead to stamina gains for repetitive movements. Working out is a second common remedy for properly preparing your body. As it relates to tennis, repetitions are more important than heavy amounts of weight. Training all of the muscles in the arm represents a good start. When working out, you want to work these areas to fatigue and then give them the proper resting period. 1-2 days between arm work is a good start to building the proper muscle strength and flexibility you need to reduce the occurrence of tennis elbow. You can also prevent this injury by making smarter decisions in your day to day life. Try to avoid placing pressures on your arm to keep it fresh for matches. 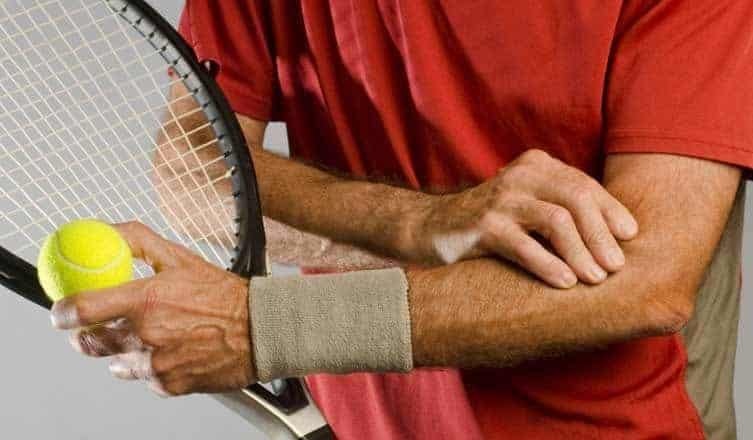 Instances like not sleeping with your body weight on that arm, keeping your arm propped up as much as possible when typing, writing, or experiencing periods of inactivity, and other such mentions are simple steps you can take to prevent the development of tennis elbow. Now that we have introduced some of the most common issues tennis players experience within their arms, it is time to influence the proper buying habits for these prevention measures. Tennis elbow braces come in all sorts of shapes and sizes. Some have internal properties that keep your arm cooled through thermal technologies, others will have properties that keep a consistent pressure on the most utilized areas of the forearm. Whatever the case may be, there are many different variants on the market. This can often create a confusion for the user. We are here to better help address some of these confusions by introducing some of the common signs to look out for when buying. This video only skims the surface of the preventative measures tennis braces provide, it does provide a brief look into wearing the fixture. Below we'll take up some additional attributes and features, helping to review these aspects to create a proper buyer's guide for the user. The first thing you need to do when an elbow issue arises is to locate the problem. Applying slight pressures to the irritated area can help you correctly pinpoint the problem location. 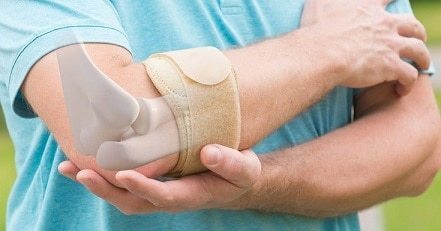 This is the key to prescribing the correct elbow brace, because there are many different options on the market. If the problem is located above the bone of the elbow, it is recommended to go with a self-adjusting strap brace. These braces are often sized to fit areas below the upper arm, making them the perfect fit for the forearm area. The adjustment allows you to allocate the correct amount of pressure below the problem area. This reduces flow and concentration on the problem area and helps keep a fluid range of motion during gameplay. The second area is pain to either side of the bone. This is where the slip-on sleeve or brace comes into play. Most slip-on models will have an exposed cut-out at the elbow. These sleeves apply pressure to the upper arm and below the forearm, working as a dual force to keep tension away from the elbow. It helps concentrate pressures below and above the source, allowing that area the proper space and at-rest time it needs to fully recover. This lightweight option does not negatively affect your game. If you have pain below the elbow bone, a full compression sleeve may be in order. This area is tricky to combat with an elbow brace or sleeve alone, calling for additional support from a wrist stint or shoulder tape to keep the arm from slouching. The compression gear works great in this space because it takes the attention from the problem area or reduces the amount of pressure you'll notice. Some compression sleeves come with cooling technology, which is the perfect fit for a problem area that is difficult to counter. Most of the braces on the market come in different sizes. Usually ranging from small to large, the size of the mechanism plays an essential role to fitting and assisting you properly. A good rule of thumb is to bump up the size of the device to reduce on skin irritation and tightly squeezing any circulation areas. The bump in size is simple to accomplish if the brace comes with straps or is adjustable. This helps you self-adjust for tightness without having to worry about sizing variations. Size adjustment is also important due to the possible severity of the inflammation. Sometimes this irritation can lead to large bumps on the elbow, which may cause for re-positioning of your brace. The smaller braces that work primarily as compression supports work best in this instance. There are two different widths to account for, with braces that suit the upper arm and braces that suit the lower arm. The most common area of inflammation is directly at the elbow, leaving the smaller option fitting the lower arm your best bet for purchase. We have listed the sizing and problem area concern, so now it is time to further differentiate these products. The best way to do that is continuing the attribute discussion. The elbow brace is often made polyurethane, canvas, or textured nylon. These materials are relatively thin, but they are usually reinforced and difficult to stretch. This keeps the sizing piece an important feature of the elbow brace. The textured nylon models with be more of a one size fits all circumstance, while the polyurethane and canvas models will run true to size. The elbow sleeve models are constructed from nylon materials and are thin in nature. There are half and full sleeve models and they can be found by size or an all-in-one fit. They may be equipped with additional padding, thermal coils, and other such technology that helps to compress the area and spread a steady air flow to the inflamed area. Due to the material construction the price range can vary on the sleeve when compared to the brace. If there are additional components being added, such as thick padding or thermal technology, the price range increases. There are basic models that house the properties that you need and are affordable in cost. Whatever the case may be, the cost of these mechanisms remains well below the amount you would pay for professional advice let alone professional treatment. This SIMIEN product is a below-the-elbow brace that is adjustable to fit any forearm size. This is a 2-piece brace, meaning the strap and the elbow pad are two separate units. The strap slings through the pad via two, plastic loop holders. This allows the user to adjust their size with ease. The elbow pad features a gel filling, which helps to form fit to the desired region. The gel also acts as a cooling agent to the heated region, counteracting the adverse effects one would experience from elbow inflammation. The surface space this brace covers is very minimal, which keeps your range of motion intact. There is a small extension coming from the pad, reaching about an inch in thickness. The other materials are thin and will not interfere with your movements during match play. This Kunto model adds pockets of support to the shortened model of the tennis sleeve. Most tennis sleeves will extend from wrist to shoulder. Kunto believes this is a waste of fabric and limits the focus area of the ailment. The better assist the user, their sleeve keeps the focus at the problem area: the forearm and elbow. This shortened sleeve features different texture pockets which help to provide supports in the key areas surrounding the ailments. These extensions included at the sides and the top and bottom of the sleeve help combat any type of tennis elbow one could feature. These thermal pockets also help to relive the pain via cooling technologies. 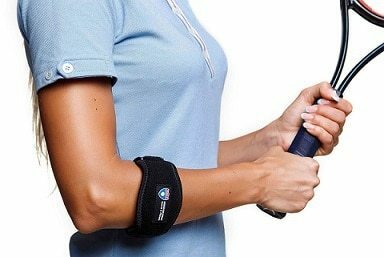 This sleeve helps to combat all forms of tennis elbow that could develop, making it the perfect fit for all ailing users. SENTEQ is the first ever system released in the elbow brace space that is medically graded as the proper fit for all users. The SENTEQ model features a strap that allows you to tighten to your desired resistance, making it the perfect fit for any sized arm. The proper fitting and holding location for this brace is below the elbow. Due to adjustability, this model is the perfect fit for all day relief, making it a candidate for wear before, during, and after play. The main portion of the mechanism features a thick, memory foam styled pad that fits to your forearm. This helps to grip to your arm, no matter the size or shape. The BandIT forearm band represents a flexible option for the user. It can be placed at any region above or below the forearm. It is designed with an elastic material that is covered with a textured nylon design. This helps the user stretch the model to their desired fit. There is a thick pad that directly locates the area of contact. This pad can be slid across the elastic band, allowing the user to pin point the area causing the problem and address it with accuracy. The elasticity helps it fit any user, although the pressure amounts will differ with different arm sizes and as you move to the upper arm area. The Runflory model is the ultimate fit for those pesky injuries that arise at the sides of the elbow bone. These forms of inflammation are tough to combat, due to their location and the increased discomforts they cause. This inflammation is at the direct location where the tendons meet the bone, making it a sensitive region. The Runfloy brace helps combat this instance by creating adjusters placed below and above the elbow bone. The elbow remains exposed when placed within this brace, allowing the focus to be generated by all other areas around this region. This brace is made from soft felt and textile materials, giving it the strong build to withstand heavy usage and the softness needed to surround the tender area near the elbow bone. It wouldn't be a sportswear conversation without all the major contributors to the space being mentioned. This is where the Nike Pro Combat model comes into play. The 2.0 model is the update to their Pro Combat product line. This update is thinner than the first installment, which helps relieve the user and it feels like nothing is there. This brace is adjustable to contour to any area of the arm, making it the perfect fit for the upper and lower arm alike. It features a gel-like pad that greets the problem area. It is adjustable for tightness and it does not limit your range of motion. After looking at many of the different variants on the marketplace, it is difficult to argue with the production being emitted from Runflory. If you are one to compare prices, there is no other tennis elbow brace that comes close to the same range in pricing. It is also adjustable at two separate regions. It helps to expose the elbow and regions around the elbow, allowing it to receive proper air flow. Due to exposure, it can be worn with an injury location. The straps are tightened far away from the elbow bone, leaving any ailment as a fitting opponent for this mechanism. The adjustments also occur at two locations, which allow you to tighten one and loosen the other if the injury is located in a specific region. This type of adjustability and flexibility makes this model the perfect fit for any elbow problems a tennis player encounters. With all braces, it is good practice to first locate the region you are experiencing the problem. This is the first step to deciding which product type will best suit your interests. Once you have your location, you can get into the additional with thermal technology, adding padding, and other such pocket supports. Below are some of the commonly asked questions users and buyers have when it comes to elbow braces and sleeves. We have provided in-depth answers to these questions to better clear up the confusion you may have. The properties in the material make up of tennis elbow sleeves and braces do not make fitting candidates for machine washing or drying. The materials can tear, and the brace could lose its elasticity if it is run through a conventional washer or dryer. The best practice is to use a basic soap and run it under warm water. You can scrub the mechanism and let it air dry. The drier can burn holes through the delicate fabrics that make up elbow sleeves. Elbow sleeves are also a prime candidate for shrinkage if run through a washer or dryer, so it is best to exercise the hand washing method. When it comes to sizing it is best to go up a size. The materials used are already made with a heavy focus on limiting irritation, so if there is some wiggle room between padding, it won't negatively affect your performance or usage. The compression component is the main concern of the user. You want it to be snug and not tight. The best analogy is when you buy a pair of shoes or a fitted hat. You want the shoes to fully encompass the foot, but you don't want them to press on the top of you foot. When you buy a fitted hat, you want the material to rest on the brim of your ears, but you don't want to feel pressure on the forehead. You should wear your brace often. The properties of a brace are directly associated to movements, making an ample number of examples we can draw for usage. During our day to day travels, we perform all sorts of arm movements. It is best to tighten the brace when you are actively participating in match play or performing a physical activity. When the arm isn't as active, loosen the brace, but keep the stable movement to help the healing and prevention process flourish. Sleeping with the brace on is perfectly fine. You are probably going to want to avoid sleeping on that arm, as irritation and too much pressure will cause for some tossing and turning during the night. If you are wearing it during a full night of sleep, you are going to want to loosen the grip as you will not be consciously aware of the pressure being applied when you are unconscious dreaming of Wimbledon. They work because they take the focus off the pain. The compression piece is a huge contributor to their success. Not only do they help advert your attention away from the source, they provide relief in helping you recover from the ailment due to their stability properties. The design and fit is another huge contributor to the recovery period and the pain reduction a user experiences with the use of a brace or sleeve. The analogy we used above with the shoes and fitted hats can be inserted back into this discussion. You want it tight enough to take the attention away from the ailing area, but not too tight that you feel pulsations in your arm, tightness at the elbow, or tinging in the arm and fingers. If you notice numbness starting to form on pockets of your arm, loosen immediately. You want to cut off some amounts of circulation near the source to prevent that area from throbbing and continuing to bother you.